P.G. Dunn Tree & Garden Care - Fencing/Gates, Garden Services, Landscaper based in West Moors, Dorset. Trees & hedges: Expertly topped, pruned, reduced, shaped, trimmed, dead wooded, crown lifted & thinning, removed. Stump grinding & removal also available. Soft & hard landscaping: patios, decking, sleeper work, decorative stone and chippings, garden features and turfing. Machine and operator also available for hire; Digger, dumper, stump grinding, rolling, footings, clearance, levelling & muck away. 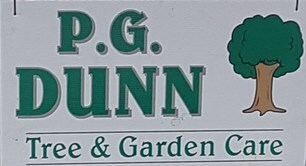 Here at P G Dunn Tree & Garden Care we only use the best quality material and fully recycle all waste, leaving your garden the best it can be. Thanks for reading our brief profile text, we will look forwards to your potential custom!